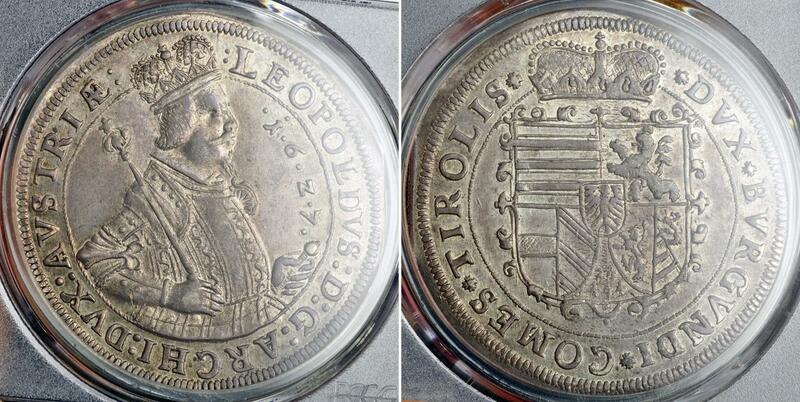 1627, Archduke Leopold V. Silver Thaler Coin. 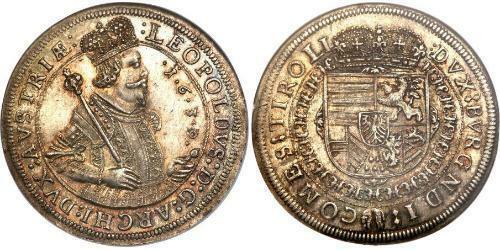 Ruler: Leopold V (Archduke of Further Austria). Reference: Davenport 3338, M &amp; T. 471, Enzenberg 23b, KM-629.2. R! 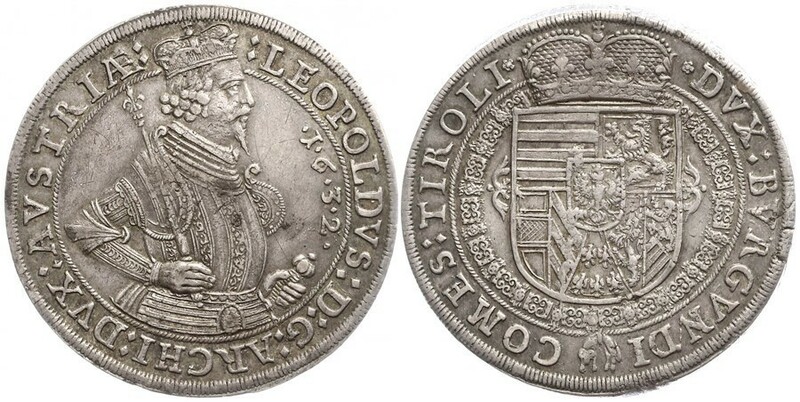 Obverse: Crowned and armored half-lenght figure of Archduke Leopold V right, holding scepter with onion-shaped top and sword. Date (.1.6.2.7.) in right field. Legend: : LEOPOLDVS : D : G : ACHI : DVX : AVSTRIAE . 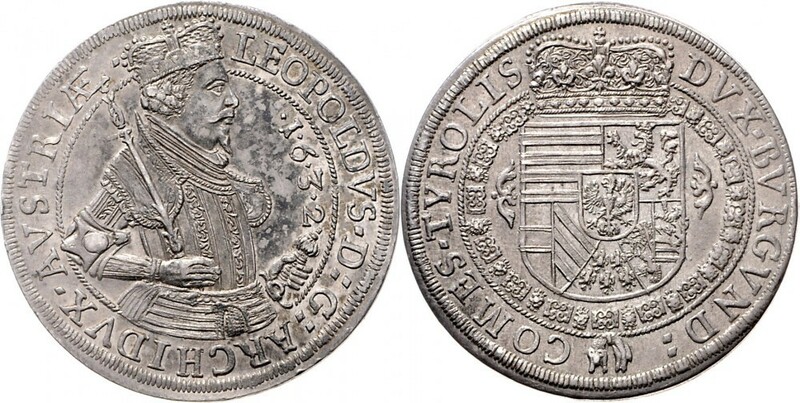 Reverse: Crowned composite arms with small tyrolean eagle shield at center. 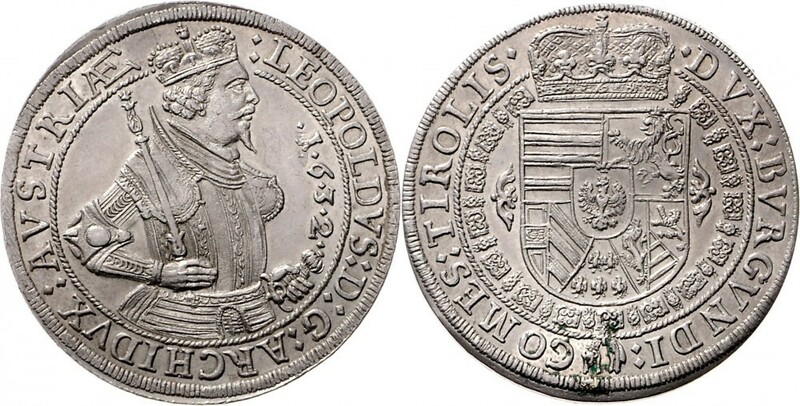 Leopold V, Archduke of Further Austria (Graz, October 9, 1586 â€“ September 13, 1632 in Schwaz, Tirol) was the son of Archduke Archduke Charles II of Inner Austria, and the younger brother of Emperor Ferdinand II, father of Ferdinand Charles, Archduke of Further Austria. He was Bishop of Passau and Strasbourg (until 1625) and Archduke of Further Austria including Tirol. In 1619 upon the death of his kinsman and former rival, he became governor of Maximilian’s inheritance: Further Austria and Tirol, where he attained the position of a sovereign, i.e Archduke of Further Austria from 1623 to 1630. He had the Custom House and the Jesuit Church be built in Innsbruck. He fought for the Veltlin and defended Tirol against the Swedes in 1632. 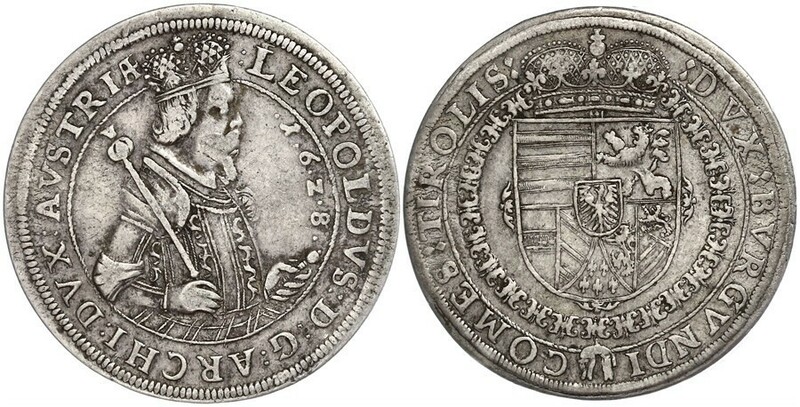 RDR / ÖSTERREICH Erzherzog Leopold V. 1619-1632. Taler 1628, Hall. 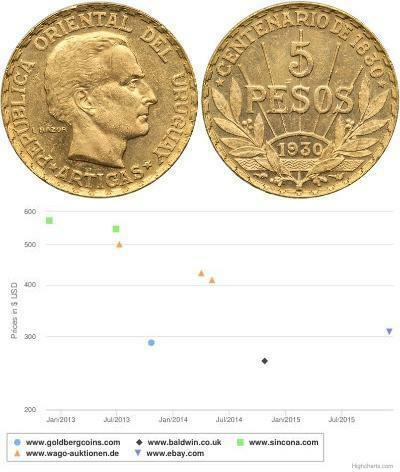 28.53 g. M.T. 471. Dav. 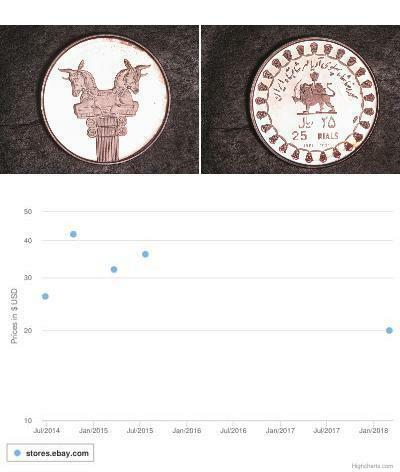 3338. Sehr schön-vorzüglich / Very fine-extremely fine.